The objective here to solicit input, gather information, identify sources of funding and ideas to support science and scientists in a post-Castro Cuba. This is the most straight-forward of all these matters. 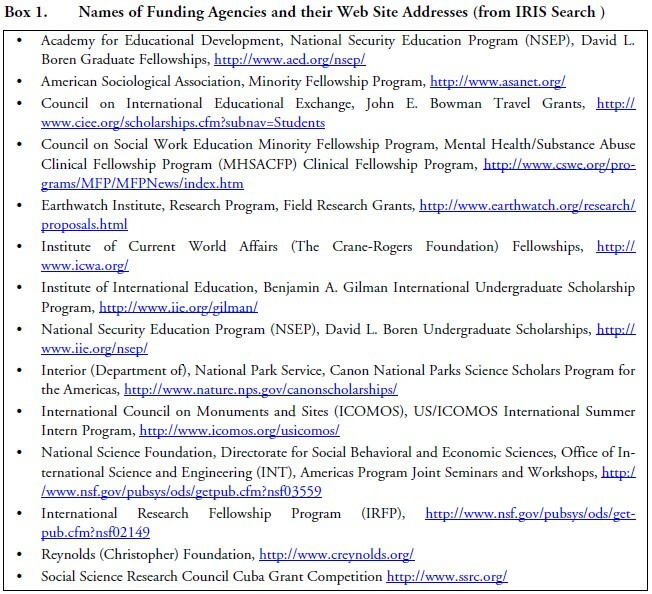 And it boils down to a shopping list of public and private funding sources (see Box 1). Some kind of infrastructure will be necessary to allow scientists in Cuba to ready themselves for the changed circumstances, and to prepare grant and negotiate collaborations. It is important that such infrastructure be pluralistic and transparent so as to avoid capture by any group seeking to use it a base to control scientific funding, or impose ideological or other restraints. There are a number of scientists from the U.S. and abroad who already work or envision working in Cuba. There are other scientists who, for one reason or another, cannot do research in Cuba; these must not be excluded. One of the potential sources of conflict is that the present Cuban government seeks to capture and to a great extent succeeds in using visiting scientists’ work for propaganda purposes and to milk their funding resources to the benefit of the Castro regime. Anecdotal accounts of such conflicts have been reported, one might rationally expect a full accounting of this to emerge on regime change. This leaves memories of such harm. One notable result of these policies of the Castro government has been to limit academic advancement in U.S. universities of Cuba specialists who are critical of the present regime. Some rather shameful cases of this have come to my attention recently. On the other hand there is a large reservoir of good will towards Cuban scientists and the scientific opportunities that the Island offers. It is suggested that at least the most rabid of Castro ideologues be gently retired, that old contacts with scientists overseas, including in the United States, be strengthened and new scientific contacts promoted. Hopefully with the help of Cuban-Americans in Congress, legislation can be prepared and approved to qualify Cuban nationals and Cuban-Americans for this funding and perhaps even develop a set aside for collaborative efforts with U.S. scientists. Building and Rebuilding Scientific Facilities and Research Reserves: It appears that much of what one sees in Cuba today are facilities left from pre- Castro times, looted ecological reserves, residues of Soviet aid projects, and display laboratories with little in-depth reality. Remedies are going to take money and time. Coping with Habits of Downwardly-Directed Autocratic Action and a Culture of Informers: There must be recognition that there are going to be conflicts in such circumstance. Conflict resolution is thus going to be a priority. The perceptions of scientists in Cuba have been severely distorted by autocratic (that is an understatement) abuses of leadership. Scientific opportunity in Cuba is still and perhaps more so in recent months tied to loyalty to present government. While abuses by present government have left a great yearning for freedom, they have also left scars and habits of downwardly directed autocratic action, and a culture of informers. This matter will have to be addressed. Coping with Rivalries in a Small Universe: One must also realize that even in the United States, academic rivalries are common and with some frequency lead to bitter “turf” battles. In the U.S. such “turf” battles are mitigated by the complexity and independence of research organizations and plethora of funding sources. Thus in the United States, science advances steadily, if untidily, despite rivalries. However, in a post Castro Cuba the “universe” of science will be much smaller and aggressively ambitious individuals will play a much larger role. Therefore mechanisms to challenge these individuals to do good science without harming rivals will be of more importance that in the far larger “world” of science in the U.S. Good funding will help ameliorate this but tact and dispersion of rivals will be needed. When to start is not clear, going to Cuba now is not as safe as it was until recently and then it there were problems. It is most probably that conferences to this end will have to be funded and held in this country. This can be started now. Planning for funding of science in post-Castro Cuba is essential. As the present leadership regime “ages” and desperately plans for its own continuance, planning for real change and which faces “real realities” becomes increasingly important. In the field of science facing such realities is also essential. Good planning is essential and urgent. Coping with the aftermath of Castro manipulation and oppression is necessary but will be most difficult. Discussion and preparation of plans must start now.